I’m very blessed to have two little girls that I call my own. The first born is four and a half years old. She is smart, beautiful and extremely needy. She has my small nose and dark gums. Everything else she got from her father. Her sister is a fierce, curly haired infant with a strawberry birthmark on her left cheek. She loves to scratch, bite and poke. Because of them I’ve had many sleepless nights. I can honestly say that it’s hard to remember the last time I had a good night’s sleep. I’ve been worried and I’ve been broke but I would not know how to even breathe without them. They changed my life in ways I could never have imagined and I could not be more grateful. I feel a familiar pain in my chest as I’m thinking this and I’m jolted back to the current happenings . Unconsciously, I let my mind wander back home where I left my infant daughter sleeping. Thinking about her triggers a let-down and I have to cross my arms, pressing down the chest to stop the milk from flowing; I do not want to risk messing up my blouse. 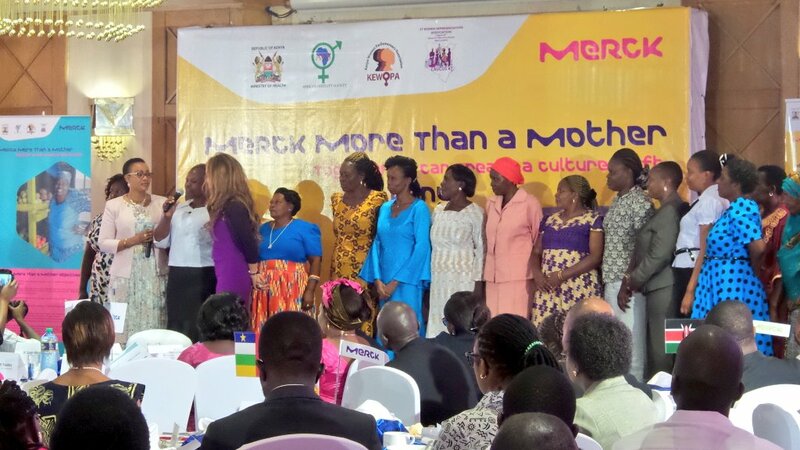 I’m at the Intercontinental Hotel for the Merck More than a Mother workshop on how we can all create a culture shift. As a mom blogger, I really needed to interact with forever-waiting-to-be mothers, hear their stories, understand them and see what little you and I can do to make their lives a little more bearable. I look at the screen in front of the room and tears well up in my eyes. Jackline Mwende’s story is playing and it is gruesome to say the least. She has scars all over her swollen face and where her hands once were she now spots bandaged stumps. Her injuries were not sustained in an accident; neither was she a victim of a home invasion. She was attacked by her own husband for something that wasn’t even her fault; she could not conceive. The saddest thing is that her husband is the one who had the infertility issues. But even though infertility affects men and women equally, more often than not, the woman is the one who carries the blame. They then suffer from isolation, discrimination and psychological trauma. They listen to other women complain about their kids and wish that they had children to complain about. We talk about how hard it is to lose the baby weight and all they’re thinking about is how they’d love their new bodies if they ever got pregnant. How they long to accidentally mess their tops with breast milk during an important meeting, or to have their kids jump on their beds at 5 on a Saturday morning when all they want to do is to sleep for a few more minutes. But instead of getting empathy and understanding, infertile women in Africa have to deal with insensitive questions, and lack of support from those closest to them. Some of the women who told their stories during the workshop talked of rejection by family members, and their husbands going out to look for other women. Empowering Infertile women Socially and Economically through Access to Awareness, Health Change of mind-set and Empower Women who cannot be treated anymore through starting a small business for them to build their independence and happier lives through “Empowering Berna” project. (L-R) Dr. Belen Garijo, Merck Group CEO, Hon. Joyce Lay, MP Taita Taveta, Dr. Rasha Kelej, Merck Chief Social Officer.. Maintaining a healthy lifestyle by eating a balanced diet. Obesity is directly related to testosterone levels; a hormone responsible for sperm production. A recent study even confirmed that it takes obese couples 55-59% longer to conceive as compared to their non-obese counterparts. Eating a balanced diet provides the necessary nutrients to optimize sperm function and minimize the effects of factors which may otherwise damage the sperm. Avoiding exposure to industrial and environmental toxins, paints and petrochemicals that may damage and impact sperm production. It is also very important to support each other as infertility is not a simple issue. It weighs you down and it means the world to know that someone has got your back no matter what.